There are a lot of beautiful word cloud images that you can find online but did you know that you can actually create one? As a matter of fact, it is so easy to do. All you need is a reliable word cloud image generator such as Wordaizer. Besides, these types of images are quite in demand. You can print them on your custom tees, mugs, laptop skins, etc. 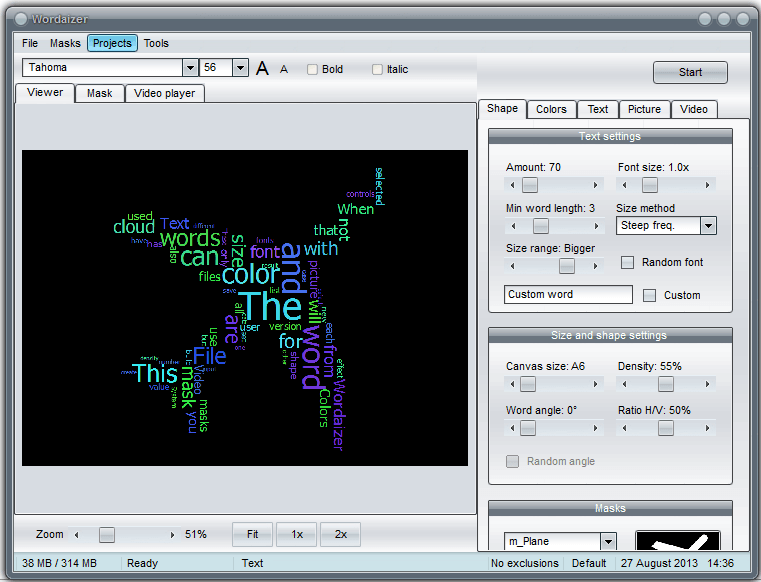 Wordaizer is a free word cloud image generator for Windows that is developed by APP Helmond. What it does is that it lets you generate a wide range of beautiful and artistic images out of texts. In addition, you can also make use of this software to save and print your images in different formats and sizes. Lots of tools and options for customizing the output of your word cloud image – e.g. shape, masks, text size, font, font style, word length, color palettes, background color, canvas size, density, word angle, H/V ratio, etc. Wordaizer is a great word cloud image generator. It features a well-designed user interface with properly labelled controls. It is also very responsive and it is easy to use. 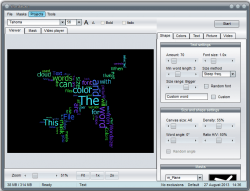 It even provides a couple of pre-loaded text files so you can start creating a variety of artistic images out of texts or words. Word cloud images are similar to ASCII art. They also have a lot of uses especially when it comes to graphic and print design. So if you have a software like Wordaizer, it would be easier for you to generate such kind of images and once you have created some new masterpieces, you can simply print them up on your custom T-shirts, mugs, greeting cards, postcards, mouse pads, pillows, etc. There is no limit to what you can do with these types of images. 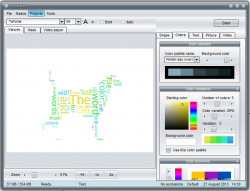 To generate a new word cloud image or wordlet, all you need to do is to load or select a text file and then you define the style of your image by changing the default settings according to your preferences. After this, you press the “start” button which is located at the top-right corner of your Wordaizer screen and the software will automatically load the new image. Through this, you will be able to preview the image output and once you’re satisfied, you can save your image as a .bmp file. You can also opt to save it as .jpg or .jpeg. If you want to save your wordlet as a working file, I suggest that you save it as .emf. This way, you can easily load the file on other image processing programs that accepts EMF files such as MS Paint. For simple projects, the Wordaizer does a pretty good job but things could get tricky especially if you want to create a more complex image. It is also a bummer that it doesn’t allow custom canvas sizes so you won’t be able to create a wordlet according to your desired image or canvas size. Other than that, the rest of the tools and options are easy to understand but you may need to study the software documentation more especially if you are not that familiar with various image generators and image processing programs. I like Wordaizer because it offers a lot of options for customizing the word cloud image. You can simply play around with its settings and options to achieve the type of image that you want. There are also a wide variety of shapes and masks. You can easily create whale-shaped images, butterfly-shaped images, etc. If you want something fun to play around with, check out this program. And I suggest that you read its documentation before using it, especially when you want to create a more complex form of word art.